May 21, 2018, Thekchen Chöling, Dharamsala, HP, India – His Holiness the Dalai Lama met with approximately 80 business leaders, artists, intellectuals and members of youth delegations from Vietnam at his residence today. Another 500 participated in the interaction in Hanoi, Ho Chi Minh City and Hai Phong over a live teleconferencing link. 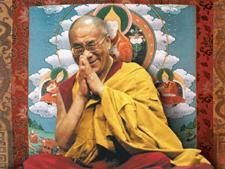 His Holiness began by emphasising the need to appreciate the oneness of humanity. He expressed regret about the extent of violence in the world and the way the poor are neglected leading to children dying of starvation. “Meanwhile,” he added, “many of those who are otherwise well-off are neither happy nor at peace. Still, scientists finding evidence that basic human nature is compassionate is a source of hope. Virtually all of us have benefited from our mother’s affection at the start of our lives. When someone is on their deathbed, if he or she is surrounded by loved ones they can pass away peacefully. From birth to death we all need affection. “Many of the problems we face arise because we pay too much attention to secondary differences between us. The antidote to this is to cultivate a deeper understanding of the oneness of humanity. 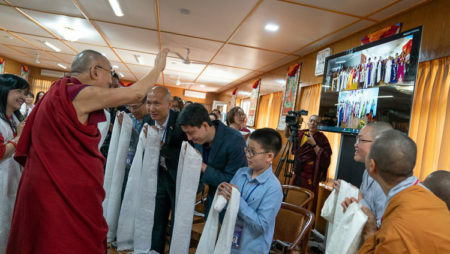 Although we Tibetans have suffered tremendously under the Chinese authorities’ tight control, we don’t use this as an excuse for stirring up hostility towards our Chinese brothers and sisters. On the contrary, a spirit of brotherhood and sisterhood is essential for our common well-being. The kind of debate and discussion that characterised the Nalanda Tradition of Buddhism, had the effect of deepening intelligence and understanding, indicating the importance of scepticism and asking ‘why’ and ‘how’.